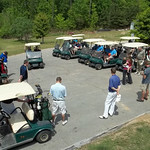 2012 Golf Tournament – Thank You! Wow, what a day! Â We had a great outpouring of love and support for a successful 4th Annual Golf Tournament today. Â Thank you to all who came out to support such a great cause. Â 100% of the proceeds today went to Families of SMA (www.fsma.org). ← 2012 Annual Benefit Thank You!